We revealed our newest craft beer passion project here at the beginning of last month – On a Quest for the Best Craft Brews in MN – and since then, our team has been anxiously reveling in each submission and watching the state of Minnesota light up as favorite breweries are nominated. We thought we’d take this intermission to offer a sneak peek of the beer and brands nominated so you remember to submit your own #MNFLAGSHIPBREW. Here are some nominees from every part of Minnesota. Castle Danger – up picturesque Scenic 61 along Lake Superior is Two Harbors, MN, home to Castle Danger Brewery. Initially located in a three-bbl brewhouse in Castle Danger the brewery outgrew, the current taproom’s patio overlooks the lake and hosts a 30-bbl brewing system to help meet growing demand. 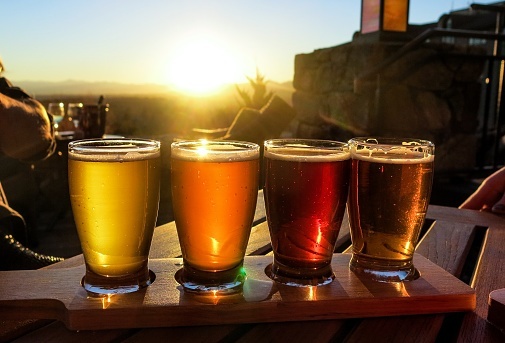 What’s the secret ingredient in their ever-amazing lineup of beer? Fresh Lake Superior water! Voyageur Brewing Company – the up, up, way UP north of Grand Marais, MN just 40 miles south of the Canadian border, is home to Voyageur Brewing Company. Even the brewery’s mission statement is all sorts of Minnesota Nice: At Voyageur Brewing Company, we strive to be good hosts and neighbors, to provide good jobs, take care of our pristine natural resources, and help sustain the community we love. Voyageur’s flagship beers all pay homage to the area in both ingredients and names. Borealis Fermentery – a small batch brewery located on the North Shore in Knife River, MN. Head brewer and owner Ken Thiemann spent time in the Netherlands as a research engineer (and then by proxy as a Belgian beer devotee) before embarking on his dream of Borealis Fermentary in 2006. The beer on draught features varying kinds of fermented ingredients giving this brewery its eponymous name. Third Street Brewhouse – Cold Spring, MN is home to some heavy craft beer history. The town’s first brewery (and state’s second oldest) was founded in 1874, and today in its place sits Third Street Brewhouse, a division of Cold Spring Brewing that opened in 2011. A year ago, the central Minnesota brewery did a little rebranding with flagships and staff, and replaced glass bottles with 16-ounce cans this year in an effort to be environmentally conscious. Beaver Island Brewing Co. – The last St. Cloud, MN-based brewery closed in 1939. In 2015, Beaver Island Brewing Co. brought brewing back to the city that once was home to six breweries. The boys of Beaver Island Brew Co. continue to grow and make a name for themselves, with new ground broken for a 10,000 square-foot distribution center slated for business in 2017. Gull Dam – the Brainerd Lakes Area of Minnesota is known for many things, and now it can add craft beer to its list of attractions. Named after Gull Lake’s iconic dam and landmark, Gull Dam Brewing in Nisswa was established in 2012, the year the dam celebrated its 100th birthday. The brewery offers 10 beers on draught and cans its Gull Dam Jet Ale, a nod to founder and former business jet pilot Mark Anderson. Fair State Brewing Cooperative – the state’s first cooperative brewery with a goal of connecting brewers and communities is at home in northeast Minneapolis, a craft beer-rich neighborhood perfect for collaboration. Fair State operates with a board of directors and offers membership to any members of the community interested in supporting the model. A dozen styles of beer are available on tap and all over the metro area. Sociable Cider Werks – one of the state’s first cider-dedicated breweries that only brews and serves ciders. And, its apple game is strong. The northeast Minneapolis-based Sociable Cider Werks uses specific Midwestern apples from Pepin Heights Orchard in Lake City, MN. The tap list rivals that of a traditional brewery, and features dry, hopped, shandy, IPA, and Kolsch-style ciders.